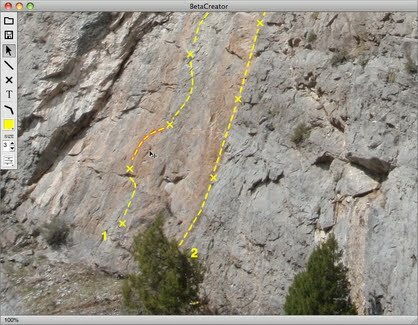 Shuswap Climbing: Rock Climbing Software- Excellent! Its called Beta Creator. And what it does is allows you to quickly show of your routes. The program is actually quite good and easy to use. It is perfectly set up for showing the routes you know or have seen. I think it would shine best if used online where you can point out new routes or possibilities in minutes, though it would still definitely have application in a real book format. Download this and donate. And use it it to share your route ideas or to showcase your First Ascent!